Home Google Google Project-Fi: Is Google Become Your Cell Phone Network? 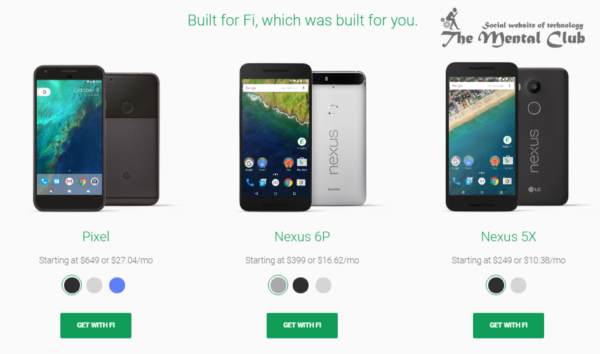 Google Project-Fi: Is Google Become Your Cell Phone Network? Nowadays, the cell phone operators truly deprive us. In one side where the technology blooming day by day, the cell phone operators go to the back feet day by day. Not about the other country but the situation of the mobile operator of our country is very disappointed. The main problem of the mobile operators that they don’t provide any unlimited plans. Call rate is growing day by day not only in other network but also in own network. They show attractive ads in television but the condition is applied for each offer. For using much internet its start fair use policy after using some GB s and its speed comes to 128kbps. And in this situation, we have to do nothing except tolerate these and decide to use that operator who has much coverage. But do you have any idea that Google can be used as the mobile network operator? Though its start at the USA only but it has some special features that we should know. Google may come to our country (India) also after getting success and then as the operators will be said good buy. Ok le, ’s know about some unique features about Google Project-Fi. If you heard about this project before then you also may read this article to get some more charming data. There are some special features in this Project-Fi that really attract you. Before starting this article let me clear you that though the article is not perfect for everyone but it may give you some valuable knowledge. You may think that Project-Fi is a cell phone network service but actually it’s a collection of the network of many cell phone networks. Project-Fi is tied with three networks and uses their Wi-Fi hotspot to provide services and according to the best network of your area its switch its signal automatically. Let’s discuss the matter elaborately. In the case of a general network, you always use the network signal of that service provider only whose network you are using. If you are using Vodafone as your operator then can get the signal only from Vodafone network or its cell tower. Now if you come in such a place where Vodaphone’s signal is very poor but Airtel’s signal is good then you can’t use your phone. But if you are a subscriber of Google Project-Fi then at that place your signal will switch to Airtel from Vodaphone that means you don’t face any problem of network signal. At present Google is bounded with three companies in the USA called Sprint, T-Mobile and US Cellular. So at any time, whichever signal is strong at the place you are its sifted itself at that network. Not only network but also connect with high-speed Wi-Fi network automatically with the change of your place. And don’t worry as you are not connected with any bad network but you are connected with only trusted Wi-Fi network and your connection is also encrypted so that no one can read your data. Even your all traffics also end to end encrypted with VPN (Virtual Private Network). So your personal or any other data can’t be captured by anyone. 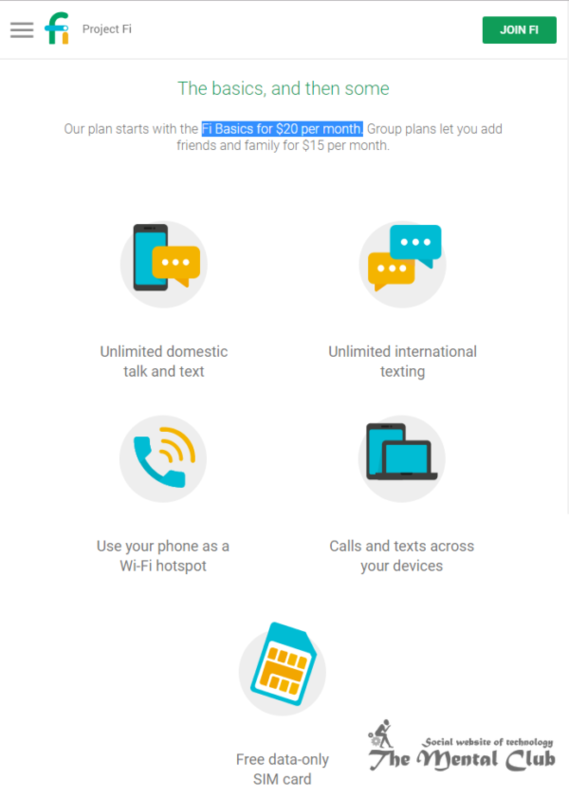 Another very good side of Google Project-Fi is its attractive tariff plan. With a charge of 20doller per month you can get the totally unlimited call and text in own country, Unlimited text in any country, to connect any Wi-Fi hotspot from your phone and surely get the chance to connect partner network. But the data rate mentioned by Google is very high and it really matters of shame for Google. The rate of 1 GB data is 10 dollar and rate of 10 GB is 100 dollar. And it is sure that other network will offer you much more data than it and also the price is low. Don’t know Google makes this type of planes. What happened Google? Is it any plane? You can do much better than it. You have also some good news here. Like with unlimited calls and text plans you have to pay that minimum bill for data that you are using. If you buy 1GB data with 10 dollars and you use only 500 MB in that month then Google will credit you 5 dollar for next month that is really good. In our country, the operators absorbed all data soon after the time finished and also not carry forward the data or extend your time of using it. How shall we use it? 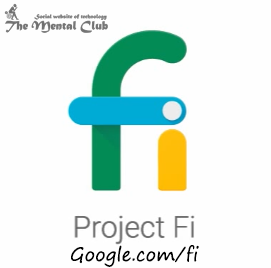 As Google Project-Fi is a cell network type service so you need a Project-Fi SIM Card to use it but very few models have options to use this SIM like Google-Nexus 6, Nexus 6P and Google Pixel phone. That means only those phone have this feature which made by Google. So after getting this device if you sign-up for Project-Fi then Google will provide you a special sim card. Now insert the sim card in your phone and activate it like other sim and then enjoy your services. Now the question is as this services are provided using a sim card then why we cant use it with other mobiles. Technically you can use this Project-Fi sim in other models also but you don’t get any information in Project-Fi website. But I see from online and on YouTube, many people prove that Project Fi SIM can be used any mobile phone but it have some conditions. Soon after getting the SIM card insert it in Google pixel or nexus device to activate it. That means you need a supported device which you can borrow from your friend for a minute. The other matter is many cell phones have some network lock. If your phone is a unlock version then no problem otherwise you have to make it unlock before inserting the SIM and it may cause some extra cost. Now you active your SIM card and insert it in a unlock mobile and start to use Project-Fi service. Technically its ok but there is also some problem. If you use some device which is not supported Project-Fi then you can get the network service from only one network the signal of other three networks won’t be switched to your phone. That means you are unable to use the key feature of Project-Fi. 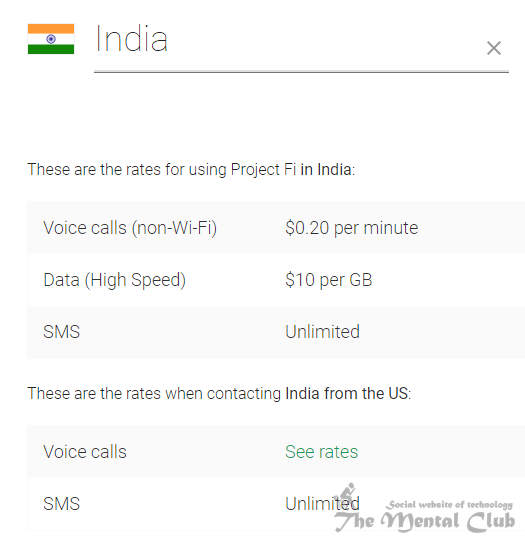 The service “Google Project Fi” is available only in “USA“. You may check the network coverage here. As this service can’t be taken from India and to use this service fully only when you have a phone made by Google then what is the reason of this discussion. It is ok but till some positive reasons for this discussion. 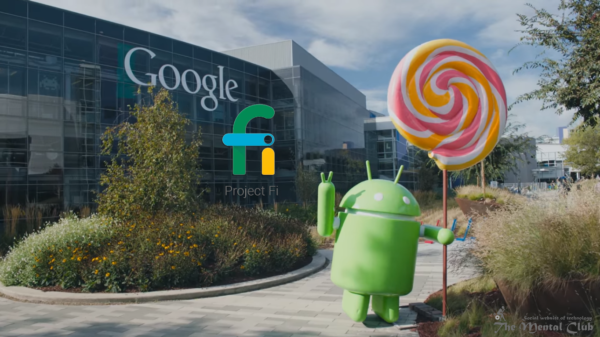 If this Project-Fi becomes famous then Google will try to give this service in many countries even they may start this service in Asia, Maybe in India and Bangladesh. Also, Google may tie-up with Reliance Jio for their Project Fi service. Now you think about your expenses per month for your cellphone And if you are a businessman then you have to join so many calls and your bill also very high. And if you are a young person then you call to a special number for which you also pay a huge money. But till you can’t enjoy an unlimited plan. Many of us pay Rs. 1500-2000 per month for their mobile plane. Google Project-Fi is very useful for them. And it has unlimited text. So you can do text chat and no need of Internet and Also, Google may tied-up with Reliance Jio for their Project Fi service. Now you think about your expenses per month for your cellphone And if you are a businessman then you have to join so many calls and your bill also very high. And if you are a young person then you call to a special number for which you also pay a huge money. But till you can’t enjoy an unlimited plan. Many of us pay Rs. 1500-2000 per month for their mobile plane. Google Project-Fi is very useful for them. And it has unlimited text. So you can do text chat and no need of Internet and Facebook. Project-Fi also can be very helpful for the villagers who use the cellphone. Village have many problems of the network, and at that place, you can get the signal from the best possible network and the problem of the network can be solved by this Project-Fi network. And the project becomes the success then this service becomes open to all as no bindings are greater than need. Again as the internet bandwidth of Project-Fi become unlimited then you need not use the old version wired internet. You can use the wireless high-speed internet. And then the matter is of future or smart home or internet of things then wireless internet only can be future friendly. I think I clear you the points. Maybe you are satisfied with the services of your mobile operator. But most of the users are not satisfied with their operator. You pay such amount of money but till don’t get an unlimited plan and that is a disappointed matter. Google Project-Fi may bring a revolution in this matter and may be the company also give better service for this competition. Now, what is your opinion about this Project-Fi. Please write me your opinion. And please share this article as much as possible. Neural Network – How will be that if the computer starts to think like a man? Man’s brain vs. Computer. How you will get Google Map without the Internet?